As we look at all that is happening in the world today, we wonder about what we can do to make the world a better place. Judaism calls that tikkun olam — repairing the world. It is our obligation to do our part. The challenge of tikkun olam is our fear of acting. Too often, we stand back and think someone else will do the task. However, if everyone thinks another will act, the world will not get better. The time is now for everyone to act. We begin by learning. Explore needs in your community. Find something that you can do or contribute to. Giving time is the best, but often giving money is important, as well. Save your change; it can change the world. Judaism teaches that there is a plan for the world but that we are given free will, the choice to make decisions about our actions. What does it mean to have free will? The world is judged with goodness means that we look for the good rather than the bad in the world. Why do some people always see the negative? Why is it better to see the goodness in the world? The Mishnah says that everything depends on many good deeds. Why are good deeds important? Why do we need lots of good deeds and not just a few? What are some of the good deeds that you can do? Ometz Lev actually translates as “strength of heart.” These are emotional, internal qualities. Courage is having the inner strength to take charge. Courage offers us the strength needed to face difficulty, danger, pain and fear. There is a midrash about the Israelites crossing the Red Sea. Moses raised his staff and the sea didn’t split. Everyone was afraid but one man stepped up and went forward. When he did, the sea split. Nachshon had courage and faith in God. Know what you stand for and being willing to be counted. All of us are afraid at times but we must handle our fears. Think about a time when you did something that you were afraid to do. Arielle “Ari” Iola was sweating out the moments before the results were announced at the Texas High School Gymnastics Coaches Association state meet Saturday at Rockwall High School. 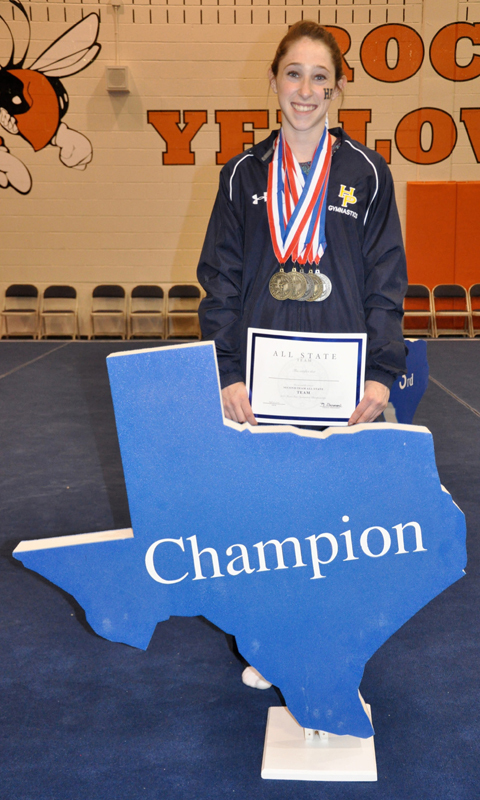 Iola, the captain of the Highland Park High School gymnastics team, was the defending state all-around champion, having swamped the field last year as a junior. But things were not so clear-cut at the 2013 meet. Indeed, Iola, the daughter of Darci and Randy Iola and a graduate of Ann and Nate Levine Academy, won her second straight all-around state championship, with a total score of 78.725 (out of a possible 80), 1.1 points better than runner-up Kassie Espinosa of Hurst L.D. Bell. She also won gold in the floor exercise — her 19.8 total was a half-point better than second-place Espinosa — and the uneven bars, on which she scored a 19.75, including a perfect 10.0 in the compulsory round Friday. She beat Espinosa and Haili Menard of Humble Kingwood by 25/1000ths of a point. Even though Iola was second overall on the balance beam — which she said is her best individual event — her 9.95 mark during Saturday’s optionals was a personal best. Her total score of 19.65 was 5/100ths of a point behind winner Kailee Coles of Rockwall. She also finished second in the vault with a 19.525, behind the 19.70 recorded by Mikea Knox of Euless Trinity. Her effort was good enough to merit an invitation to the National High School Gymnastics Association Senior Showcase Invitational, scheduled for May 16-18 in Fort Myers Beach, Fla. But before Iola could win that accolade, she had another hurdle to overcome, in addition to tougher competition. Recover she did. She was first in the all-around after Friday’s compulsories, so she had “my favorite rotation” — vault, bars, beam and floor exercise — during Saturday’s optional routines. She acknowledged doing a little scoreboard watching between apparatuses. Her last event, the floor exercise, was done to a mix of Spanish music that Iola said she had been doing for years. Iola started gymnastics at age 5, when the family was living in Tulsa, Okla.
“My mom said I was scaring her on the jungle gym in the backyard,” she said. Darci Iola backs that up. WOGA is the gymnastics club that produced Olympic gold medalists Carly Patterson and Nastia Liukin. “We moved to Dallas because of WOGA,” Ari’s father, Randy, said. Many local gymnasts and other athletes on elite-level tracks attend Spring Creek Academy in Plano, but that wasn’t part of the Iolas’ plans. “When she got to seventh grade, we discussed with her that she had to make a choice whether to go on the bat mitzvah track or stick with gymnastics,” Randy Iola said. There wouldn’t be time for both elite gymnastics and all that’s required for the bat mitzvah. So she celebrated her bat mitzvah at Anshai Torah in Plano, graduated from Levine and started at Highland Park, where she discovered there was a gymnastics team. She made state her freshman and sophomore years, and won the all-round, beam and floor state titles as a junior. She also was second in the vault and tied for fourth on the uneven bars last year. “I think my routines are more consistent and the scores keep getting better,” Ari said about this season compared to last. In addition to the thrill of victory, gymnastics had given Iola so much more, she said. In fact, one of the teammates she is leading is also Jewish. Highland Park sophomore Roslyn Saplick placed 61st in the all-around competition and down in the field on the individual apparatuses. Iola’s gymnastics career may be coming to an end, however. She hopes to major in kinesiology or pre-physical therapy, she said. I can see that I am going to have to be on my toes with sister Linda setting up shop two pages back. When I opened her column to edit this week, I saw almost an identical sentiment to what I had intended to open this week’s installment of Around the Town with — a heartfelt thank you to all of those who have been so kind to email, call, stop me at the grocery store or carpool line and even drop me a note by snail mail to say how much they enjoyed last week’s issue of the TJP. And no, not all of those comments came from my mother-in-law, but she did have her share. It is truly meaningful to me, and all of us here, when we hear from our readers that we are doing a good job. Usually, we hear from folks, when we have gone astray in one way or another. So again, thanks. We had a great story on the exhibit in last week’s TJP. If you missed it, you can catch it online at tjpnews.com. The group will meet at 10:30 a.m. at the Intermodal Transportation Center in downtown Fort Worth and will have an adventurous trip riding the TRE, DART Orange Line, and the historic McKinney Avenue Trolley to arrive at the rear of the museum at 12:28 p.m.
“Chagall: Beyond Color” presents the artist’s beloved paintings alongside his works in sculpture, ceramics, and collage to explore his relationship with space and volume. The Dallas Museum of Art is the only U.S. venue, and the co-organizing institution, for this internationally touring exhibition featuring more than 140 objects including paintings, costumes, sketches, ceramics and sculptures. Chagall was a romantic and a Russian Jew who was widely traveled, although he used Paris as his home base. He was in Russia at the outbreak of World War I and was not allowed to leave. He fled to the U.S. before World War II. The group will return to the Intermodal Transportation Center at 4:14 p.m. Cost is $20 and includes exhibit admission, train fare and bottled water. They will be brown-bagging lunch on the train. Among those who submitted RSVPs by press time are Anita Davidson, Julian and Marian Haber, Etta Miller, Jane and Arthur Pawgen, Jacquie and Irv Robinson, Barbara Rubin, Larry Steckler and Sheila Stocker. To make a reservation call, with your credit card, Barbara Rubin, 817-927-2736, or Larry Steckler, 520-990-3155. For information, call Rubin. The Sylvia Wolens Daytimers is a program of Beth-El Congregation with financial support from the Jewish Federation of Fort Worth and Tarrant County. Incidentally, the most recent Daytimers program held earlier this month featured Martin Tobey’s visual and musical tribute on “Why Like the Opera?” was well attended. Marty played music and showed visuals from several operas as he spoke. Dennis Yslas, customer service manager for the opera, brought season brochures for the Opera Festival. Irv and Jacquie Robinson greeted the guests at the door. Idelle Luskey and Mary Frances Antweil hosted the lunch buffet. Emcee for the day was Rosanne Margolis, and Marty was introduced by his good friend and fellow opera buff, Len Schweitzer. There was a time when I would have addressed the Tobeys only as “Dr. and Mrs.” … back in the days when I was the No. 1 babysitter for their children, Danny and Rachel, who now are both married, and Danny is a dad. I’m sure you know Danny is an attorney with Vinson & Elkins in Dallas and the author of the acclaimed thriller “The Faculty Club.” Rachel Walsh is an internist practicing in Dallas. Ina Singer phoned to tell me that Jewish Women’s International will have its closing luncheon at 11:15 a.m., Wednesday, May 1 at Szechuan on Bryant Irvin Road. RSVP to Ina at 817-292-1580 for a wonderful get-together celebrating the success of the past year. JWI will open its 2013-2014 season next October. Remember, the JWI programs are always on the first Wednesday of the month. Stay tuned next fall for information on the next installment. We all know what TGIF is, right? This is TGIShabbat. Chabad of Arlington will welcome Holocaust survivor Izzy Schindelheim to the synagogue next Friday, May 3 for a program after 6:40 p.m. services. He will share his amazing story of survival. The evening is free of charge and includes dinner, though there is a suggested donation of $10 per person or $40 max per family. RSVP at your earliest convenience by calling 817-451-1171. Chabad of Arlington is located at 2136 Lindblad Ct. in Arlington. • From 10 a.m. to noon Sunday, April 28, the federation Young Adult Group will host Schmooze over Schmears at the Federation, 4049 Kingsridge Road. If you or someone you know are between the ages of 21-45 and want to learn more about YAG’s programs, activities and special events, this open house is sure to please. For information, contact Angie Kitzman at 817-569-0892 or a.kitzman@tarrantfederation.org. • At 7 p.m. Monday, April 29 at Ahavath Sholom, the Isadore Garsek Lodge of B’nai B’rith will present the dynamic Israeli music group the Fountainheads in concert. Tickets are free, but must be picked up in advance by calling 817-569-0892. This is a super family-friendly event. Let me hear from you. Send me your photos and news to sharonw@texasjewishpost.com, or 7920 Belt Line Road #680 Dallas, TX 75254. Or, better yet, pick up the phone and give me a ring at 817-927-2831. I look forward to talking to you. Something has bothered me for years with the prayer service and many verses. It never occurred to me to ask someone, and my wife encouraged me to ask you. If we believe there is only one God, why do we refer to him with so many different names? It almost feels like we are talking to a number of different gods when sometimes we pray to Adonai, sometimes to Elohim, etc.? Please explain, and I thank you in advance. Great question. I’m glad you finally asked. The important concept to understand is that the names of God are actually not describing God Himself. The essence of God is above names, descriptions or even our understanding. To assign a name to something is to fit that thing or being into a finite description. The first task given to Adam after his creation was to assign names to all the creations (Genesis 2:20). To do so was to delve into the essence of each animal and to see its purpose in the master plan of creation. A person’s name is said to be divinely inspired and to define one’s makeup and their mission in the world. This goes to the core of the meaning of the word “name” in Hebrew, or shem. The word shem is spelled shin mem, the same way the word sham (over there) is spelled. The same spelling in Hebrew reveals a deep connection between the two seemingly unconnected concepts. What is that connection? Every creation has its roots in sham — “over there,” meaning in heaven. From heaven stems its essence, the word that was uttered at the time of its creation. That word is its name, its shem. The process of naming is something that does not work when it comes to a being who is infinite and belongs to another realm completely. If so, what are the meanings of the names of God? The sages explain that the names of God are not in any way attempting to describe God Himself, rather they are description of the way God interacts with the world. We refer to God not as Himself but as His actions, although His essence is above our grasp His actions are within our ability to analyze and fathom. At times, God shows compassion, at other times loving kindness. There are situations when He finds it necessary to mete out strict judgment. During certain periods of history, God reveals His presence in a way that is clearly noticeable. At other junctures, He sees fit to hide His existence. There are times when all the above could be happening simultaneously. These interfaces are what we attempt to learn, understand and fathom, revealing God’s connection to us and the world. We do not have the space in this column to actually explain some of the names of God, but perhaps we shall do so in next week’s column. I hope this answers your basic question and will give you more meaning when you pray. Lots of people know that Chicago is called the Windy City, but they think it’s because of real wind. Yes, there’s some of that; in fact, when I moved there way back in 1957, sports-car warnings were often posted on Lake Shore Drive. I think of this now because I see that Robin Kelly has won a special election to replace former Second District Rep. Jesse Jackson Jr. in the U.S. House. If you follow Illinois’ always-fascinating politics, you know that he resigned in disgrace late last year during a federal investigation and pleaded guilty to bribery charges in February. His day in court awaits. Ms. Kelly hails from a south-of-Chicago suburb abutting the one where I lived for 17 years before coming to Dallas. But for half a decade before the ’burbs, I lived in the heart of the city itself. The first knock on my new door after my late-summer move-in was from Phil Shapiro, who introduced himself as my Democratic precinct captain. How nice, I thought, with a naivety that young newcomers quickly lose in Chicago. He didn’t even ask if I was a Democrat. He didn’t even care. What he asked was if I would register Republican and become a precinct election judge. He didn’t care what party I favored. This was a virtually all-Jewish, definitely all-Democratic neighborhood, so getting two Democratic judges was a piece of cake. But Republican? Problem. Yet, by. law there had to be two; the vote count had to show at least two straight-Republican ballots cast in every election. Phil’s only hope was to troll for “victims” among locally uncommitted new residents like me. I respectfully declined, saying something about how I wasn’t even settled in yet and not ready to commit to such a responsible job, but admitting no party affiliation. Phil smiled and handed me his card, saying if I decided I could help him out, just give him a call. Before he left, he invited me to the precinct’s annual picnic the coming weekend. Also before he left, he dropped a $5 bill on the little hallway table near my front door, which I didn’t even notice until quite a while later. If you go back that far, or follow what’s happened to U.S. money in the last 55-plus years, you’ll realize that $5 then was worth much, much more than it is today. I went to the picnic and heard Precinct Captain Phil proudly introduce the day’s main speaker: “My cousin, Lieutenant Governor Sam Shapiro.” Sam served under Gov. Otto Kerner and finally got his big chance in 1968, when the top banana resigned to become a federal judge — later becoming a federal prisoner guilty of bribery, conspiracy and (of course) perjury. Sam served as governor only briefly, losing his 1968 bid for election on his own to Richard Ogilvie, who a scant four years later lost his try for re-election to Dan Walker, who also wound up in federal prison for involvement in some savings and loan scandals. And so the wind blows in Illinois. Postscript: I’m not a political person, but I do learn fast. I was in Illinois, so I kept Phil’s money. Later, I became an election judge on my own. Guess which party. I was immensely gratified by the kind thoughts of TJP readers who either called or emailed me to welcome me back to the TJP fold. Thank you all for that. The fact of the matter is, from my perspective, if one grew up in the Wisch family, one never really “leaves” the TJP. We may take a “voluntary sabbatical” from time to time; however, we seem to have printer’s ink in our veins, in addition to blood and the hereditary “nose” previously discussed. 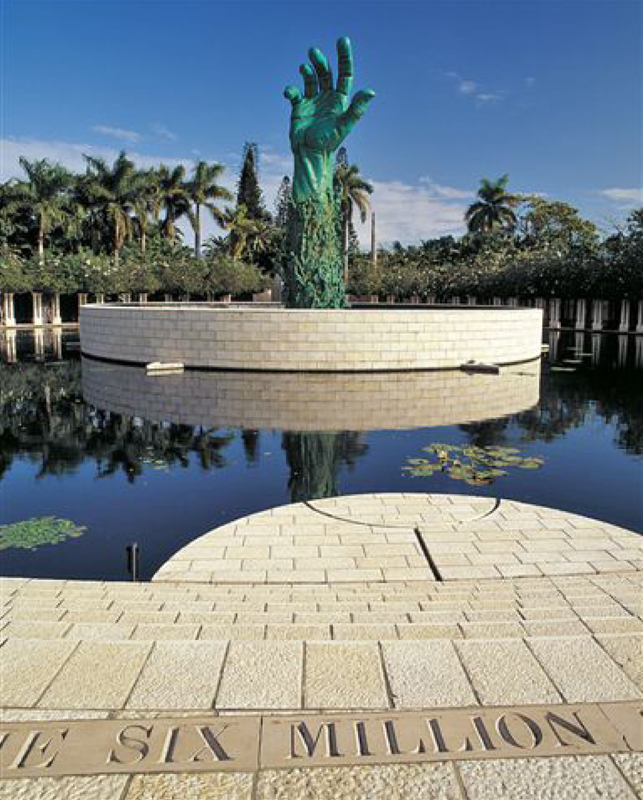 Last week I reflected on a few personal experiences, and knew that my article was missing something important: A photograph of the Miami Holocaust Museum. My personal photographs were “lost” in my move from Carta Valley to a newer home north of Carta Valley. I contacted Sharon Horowitz, executive director of the Holocaust Memorial of the Greater Miami Jewish Federation, who graciously provided me with some visual aides. Our Dallas/Fort Worth community is fortunate to have a remarkable Holocaust Museum in downtown Dallas. I wanted to remind our readers that author Bryan Mark Rigg will be featured at 6:30 p.m., April 25 at the Dallas Holocaust Museum/Center for Education and Tolerance. Rigg, author of “Hitler’s Jewish Soldiers: The Untold Story of Nazi Racial Laws and Men of Jewish Descent in the German Military,” will talk about his time spent in Germany researching his book and the shocking revelations he uncovered. Rigg spent years researching the book, canvassing Germany and interviewing countless individuals, ultimately accumulating more than 30,000 pages of records. Since then, he has produced a stunning work, uncovering stories and a history that few have heard. Rigg received his B.A. with honors in history from Yale University in 1996. Yale awarded him the Henry Fellowship for graduate study at Cambridge University, where he received his M.A. in 1997 and Ph.D. in 2002. Currently professor of history at American Military University, he has served as a volunteer in the Israeli Army and as an officer in the U.S. Marine Corps. His research for this book has been featured in The New York Times, Los Angeles Times and London Daily Telegraph. The thousands of pages of documents and oral testimonies he collected were purchased by the National Military Archive of Germany. The Bryan Mark Rigg Collection is housed in the Bundesarchiv-Militärarchiv in Freiburg, Germany. This work is the conclusion of a decade of Rigg’s research while a student at Yale and Cambridge. His book is the result of his efforts. Rigg conducted groundbreaking research into the lives of the Jewish soldiers who served in Hitler’s armed forces. For information, contact the Holocaust Museum at 214-741-7500. LEFT: Panelists at the Israel Bonds women’s brunch were, from left, Karen Katz, Frannie Gardner, Susan Colin and moderator Alix Strauss. On Sunday morning, April 14, an overwhelming crowd was treated to a topical and interactive program titled “A Front Row Seat: Business, Success, Family and Living Jewish,” which highlighted three exceptional Dallas businesswomen: Karen Katz, president/CEO of the Neiman Marcus Group; Frannie Gardner, adviser for Armor Wealth Management; and Susan Colin, owner of oysongs.com. Alix Strauss, an award-winning author, satirist and media personality moderated the program. Helene Herbstman, national women’s division chair, discussed the importance of investing in Israel and shared her excitement of the National Women’s Division Campaign. Chairing the event was Renee Stanley, long-time Israel Bond advocate and community leader. We’ve heard that tremendous enthusiasm and energy was created at this re-launch of The Dallas Women’s Division of Israel Bonds. Sharyn Fein, marketing and staffing manager of Apple Care and Companion, a home-care agency, announced that its second annual “Compassion Fatigue Symposium 2013: Rekindle-Renew-Reconnect” will take place from 8 a.m.-3:30 p.m. Friday, April 26 at First United Methodist Church, 503 N. Central Expy. in Richardson. Although the event is currently filled to capacity at 300-plus attendees, there may be some last-minute opportunities for attendance. Six Continuing Education Units will be given for all disciplines: nursing by H.I.S. Cornerstone’s Robyn Horn; social workers by TCU’s Harriet Cohen; LPCs by Susan Stacy of Helping our Helpers; and Completion Documents by Apple Care and Companion. The purpose of the symposium is to basically educate “people on the things they don’t want to hear.” Fein said that as the baby boomers get older and their parents live longer, they wind up in a cycle of balancing their own aging with their parents’ needs. This symposium will, perhaps, provide relief to professionals and caregivers, and help them learn to deal with the stresses of the challenges of balancing work, caregiving, raising families and maintaining good emotional and physical health and well-being. For information, contact Sharyn at 469-619-5474, or sharyn.applecare@gmail.com. The 20th annual Genesis luncheon will be held Thursday, May 2 at the Hilton Anatole in Dallas. Former President George W. Bush will be the keynote speaker. In addition, Baseball Hall of Famer and Texas legend Nolan Ryan is serving as honorary chair. For information, contact Bianca Jackson, Genesis director of development, at 214-389-7703. Sometimes I pray and I am far away from prayer. My mind and my heart are someplace else. But many times I am there, focusing deeply on the words and their meaning. There can be more, though. An aura of serenity at times descends upon me and I feel enveloped in oneness. At those moments all of me is praying. All of me being in the moment, uplifted towards momentarily altered consciousness. I have come close. My heart smiles and is content. And then I realize that I had been earlier praying with my mind, but not with my whole being. My head had been in the tefillah, but not my heart. When does prayer really become prayer? Perhaps when we go beyond the words. Not ignore them, but rather see them as stepping-stones towards God. The prayer experience must begin with the text. However, the text is only the means and not the end. We praise, we beseech, we request, we thank. But it does not end there. The text ought to bring us to a different place, a higher place. We have to open ourselves up to that. It is really about connection to the transcendent. The meaning of the verse according to the Izbitcher, as he is known, is clear. God is merciful, and we must be merciful as well. The mother animal must not be subject to the anguish of seeing her young slaughtered before her eyes. Spare her the pain. Yet the Talmud in Tractate Megilla warns against citing this explanation of the commandment at any place in one’s prayers. We must never ask God to be merciful upon us, just as he has commanded us to act mercifully toward the animals he has created. But why not, asks Rabbi Leiner? We must pray, he answers, to God, and not to the God of our understanding. We are asked to leave behind our limited, circumscribed conception of God. Prayer is meant to bring us to a place beyond human grasp. It is a journey toward God — not toward God as we understand Him, but toward God Himself. We ought not to make the mistake of confusing God with his commandments and certainly not with our understanding of his commandments. He has given us many and various tools and methods to strike out on our quest, but the goal is beyond all of these implements. Our minds and our deeds can take us only so far. At a certain point, we must let go, but not completely. First we must do what has to be done and think what has to be thought. But then we have to open ourselves up to the illumination that is beyond us. Activity must give way to passivity. Assertivity must give way to receptivity. We loosen our grip, empty our minds and let go. Then, perhaps, we can really pray. Rabbi Hanan Schlesinger is executive director and community rabbinic scholar at the Jewish Studies Initiative of North Texas. Dallas’ trails and tribulations topped the issues discussed during the Dallas City Council candidate forum Monday, April 15 at the Aaron Family JCC’s Zale Auditorium. The Jewish Federation of Grater Dallas’ Jewish Community Relations Council organized the event, and JCRC chair Shirley Davidoff served as moderator. The Northaven hike/bike Trail and the bond money spent on the city’s trail system dominated the discussion between District 11 candidates Lee Kleinman and Ori Raphael during the last half of the two-hour forum. Kleinman said he was proud of trail project and noted that money for trails was added to the city’s 2012 bond package at residents’ request. To Raphael, the trails are simply a symptom of a greater ill. The spending debate spread to the issues of libraries. Kleinman said he was a big supporter of the library system and mentioned the budget cuts libraries suffered in 2008. Asked what they would do in their first 100 days after being elected, Kleinman said he would make sure he got on the transportation and economic development committees. Raphael said his first move would be to call for an up-or-down vote on a ban on texting while driving and advocating for the city to develop a 3-1-1 app so people can report potholes and code violations via smartphone. Raphael also said he would make sure constituents could contact him any time with such problems, and he would personally work with the appropriate city department to get the issue fixed. The first half of the evening featured a lively encounter among District 13 candidates Leland Burk, Jennifer Staubach Gates, Jacob King and Richard Sheridan. Burk said he was running as the candidate with the most business experience, as well as someone who has a strong history and legacy of community service. Gates focused on her record of service and said she has managerial experience through working with non-profit budgets. King, a high school student, believes Dallas should be looking 45 years into the future and that as a young man, he would be able to focus on what his generation will need. Sheridan, a perennial candidate, acknowledged he is controversial but believes Dallas is a highly corrupt city. Gates mentioned her nursing experience. Sheridan said the first things that need to be done are to fire City Manager Mary Suhm and City Attorney Tom Perkins, though the latter announced he will retire in August, and develop an ethics code. • Burk said two-third of the city’s budget goes to public safety, and that needs to be maintained. Gates said public safety is the No. 1 issue for her, along with quality-of-life items such as parks, arts and culture; streets; and spending without waste. King said budget cuts can be made in government operations, debt service and cultural affairs. Sheridan said education must be addressed. • Burk and Gates would like to build the new libraries for which land was purchased. King said money that would go to new libraries is better used to fund more pressing needs, like new reservoirs to get more water into the city, though he does not favor any more library cuts. Sheridan said Mayor Mike Rawlings is being hypocritical for saying he wants to improve education but wanting to continue to reduce library hours. • King said the city should be open to gas-well leases on park land not open to the public. Sheridan said permission to conduct the hydraulic fracturing method of gas extraction (fracking) should be in the hands of the Texas Railroad Commission and not cities. Burk said he was opposed to drilling anywhere in Dallas, and Gates said she’d look at drilling on a case-by-case basis, but not on park land or in neighborhoods. Early voting for the May 11 election will take place Monday, April 29-Tuesday, May 7 at various locations in the city. Election Day polls will be open 7 a.m.-7 p.m. at precinct polling places. I underwent an Orthodox conversion just less than a year ago and have a couple of questions which my rabbi wasn’t sure how to answer. First, I was taught that a convert receives a new, Jewish soul. If so, what happens to the “old” gentile soul I had before? On one hand, it’s invigorating to know I’m receiving something new, which makes me into a “new person” in a way, but somewhat disconcerting to think that there’s nothing left of my old self. After all, it was my old self that was first inspired to take the steps to convert. Is that “original me” who made that decision gone forever? Secondly, a practical question: Every morning should I be reciting the blessing shelo asani goy (who has not created me a gentile?) On one hand, I was “created” a gentile, on the other hand, if I have a new Jewish soul, perhaps it’s like I’m “newly created” and could recite the blessing? Thanks for your input. Great questions. And congratulations on your conversion. The answer to your first question is yes. You received a new soul and retain the “old soul” as well. There are many sources that confirm this, and the meaning is as follows: Every Jew, at certain times, experiences what is called the “expansion of the soul.” For example, on Shabbat, we all receive a nashama yeseira (expanded soul) in order to have a receptacle worthy of receiving all the spiritual energy showered upon us on Shabbat. This does not mean our “weekday soul” is replaced by another soul. Rather, our weekday soul is expanded more toward its original glory, before it was confined into a physical body. Shabbat, which contains a bit of the next world, allows for that expansion as the soul feels the entry into the next-worldly space of Shabbat. The entire Jewish nation received permanently expanded souls at Mount Sinai, where the Jewish people all converted to Judaism. The Abrahamic souls of the original Israelites were expanded to be a suitable receptacle to receive the immense spiritual energy within the Torah. Every gentile who converts to Judaism experiences a private Mount Sinai experience at the moment of conversion. The souls of those who decide to convert are considered unique, even before conversion, as they have a spark of the Jewish soul, which was the impetus to take this step. Some explain that those souls belonged to individuals of the different nations who were approached by God to offer them the chance to receive the Torah before Sinai. When the nations turned it down, those individuals wanted to accept it but couldn’t. Those souls were just waiting for the time they could make good on their desire to join the Jewish people. That spark would not let them rest until it was fanned into a full flame. That original soul that brought all this about is still there and intact, just fully expanded into a “Sinai soul” at the time of conversion so they can receive, contain and retain all the holiness of the Torah. Although the original soul is present, the newness is sufficient for the Talmud to consider the convert as katan shenolad (like a newly born person). This has many ramifications in halachah, Jewish law. For this reason, some authorities rule that a convert should recite the blessing you mentioned because you have been “remade” as a Jew. Others disagree, but my feeling is to side with the authorities; you should recite that blessing and not to do anything different than the rest of the Jewish people.